Matthew Amata is seeing a disconnect between the number of boats repossessed from failed dealerships and those showing up in his yard and those of other boat remarketers. 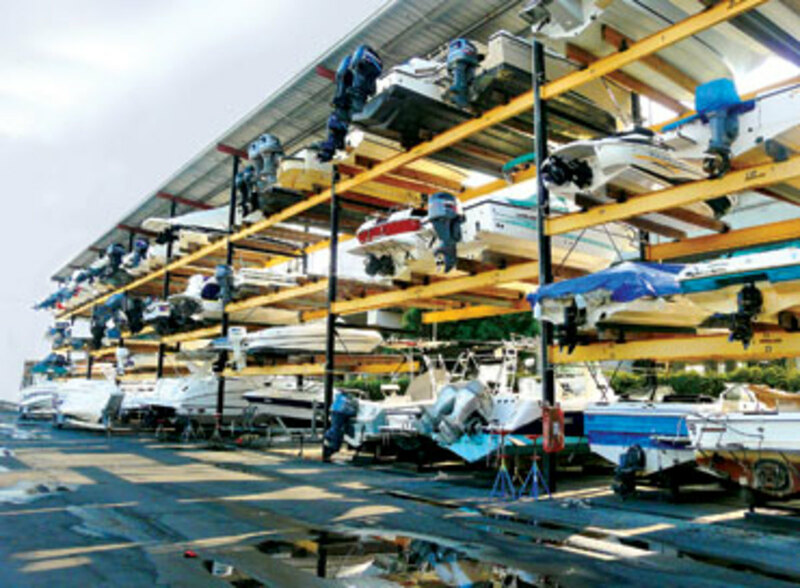 Repossessions in the fourth quarter at National Liquidators, one of the nation&apos;s largest outlets for auctioning repossessed boats, were up just 9 percent over what they were for the same period in 2008, says Amata, the Fort Lauderdale company&apos;s vice president. Yet inventories from bankrupt dealerships continue to grow. Amata says a lot of the boats that floorplan lenders repossess from distressed dealerships wind up at other dealerships, where they sit in the back of the showroom while dealers push their own inventories out the door because they are holding floorplan loans on these boats. Inventories of boats from distressed dealerships are "increasing significantly," Amata says. "And I suspect there will be increased levels of wholesale repossessions through 2010." Amata says those inventories ought to be going straight from the showrooms of failed dealerships to the remarketers. Otherwise, they will continue to clog the sales pipeline. "We can get them off the books in 60 to 90 days," he says, and typically at prices just 5 to 10 percent below "book" - the up-to-date values listed in the NADA used-boat price guides. Amata believes the best way to stabilize the boat market is to move repossessed inventory now instead of letting it sit in dealer showrooms. He says dealers are not geared up to sell repo boats. "It is our core business," he says. "Give us a boat, and, on average, we sell it in 64 days. That&apos;s a tremendous statistic." Amata says National Liquidators has been selling boats at about the same rate as it has been taking in inventory, while operating at just 75 percent of capacity. He believes the remarketing industry has the capacity to move more boats from failed dealerships in 2010 without dramatic disruptions to the marketplace. In addition to boats from failed dealerships, he says he and other remarketers have been seeing more repossessions of privately owned boats, especially big ones over $500,000. "That business is exploding," he says. "Just this week alone [in mid-January], we had inquiries on a half-dozen [big boats]." Bankers and remarketers discussed some of these trends at the National Marine Bankers Association&apos;s annual conference last November in Hilton Head, S.C. "We&apos;re seeing a lot more people giving up their boats in 2009," says M&T Bank vice president Michael Ryan. "And they are bigger boats now - 30-, 40-, 50-footers." In 2008, repos tended to be smaller boats. In 2009, more affluent folks - those who tried to hold on to their boats for as long as they could - were throwing in the towel and letting the bank foreclose on them, he says. With repossessions still on the increase, used-boat prices could "dip slightly" again as the slow winter sales season goes forward, says Lenny Sims, a vice president at used-boat price guide NADAguides.com. Ryan suspects foreclosures will continue apace until unemployment bottoms out. The economy lost 7.6 million jobs from December 2007, when the recession began, to December 2009, when unemployment still was hovering around 10 percent. The large number of repossessed boats on the market has had a depressing effect on used-boat prices, though not nearly as much as one might expect. In 1995, National Liquidators was selling most of its repo boats at 98 to 102 percent of "book" price, Amata says. "Now we&apos;re selling at 90 to 92 percent of NADA." Amata says lenders actually have "held the line pretty well" on the pricing of repossessed boats, but there is a glut of some brands in the repo market - Sea Ray, for one. "We&apos;re not getting close to book on those," Amata says. Hinckleys and Tiaras, for example, have been doing a lot better and selling closer to book value because there are a lot fewer of them in remarketers&apos; inventories, he says. At least 17 of the 88 attendees listed in the NMBA conference program were from repossession and recovery, auction or remarketing companies dealing in repo boats, a strong indicator of that segment&apos;s growth during these tough times. Amata says the remarketing firms will be vital to moving repo boats through the pipeline in the months ahead, and they can do it with single-digit margins. Amata says his auction staff tries to establish a boat&apos;s value for resale from the price guides - NADA and the ABOS Marine Blue Book - by assessing a boat&apos;s condition and inventorying its equipment, examining its own recent sales figures for similar boats, and checking Internet listings. He says Internet listings are a poor indicator of market value because listing prices often reflect a boat&apos;s loan balance, which in today&apos;s market may be significantly less than the market value. NADA&apos;s Sims says his price guides, updated monthly online, reflect the results of surveys of used- and new-boat sales from some 285 retail dealers and remarketers. There are some market forces exerting upward pressure on used-boat prices. International buyers are driving up the wholesale price of used boats, says Sims. Also, the sharp reduction in new-boat construction ought to stimulate interest in used boats and help push prices up, says Tom Fournier of ABOS. "The used-boat market - that&apos;s where it&apos;s going to be at," he says.